We’ve seen our fair share of e-wallets in the recent days, and Malaysians now have yet another choice on our hands. Razer Pay, announced last year in Singapore, is now available to Malaysians. Touted as specially designed for youth and millennials, “Users can top up easily, transfer money quickly, and pay everywhere,” according to a press release. At the moment, topping up is not possible via credit card; users can visit any 7-Eleven store in Malaysia at any time to buy a Razer Pay top-up PIN. Users can also use their online banking account to add funds. Participating banks include AmBank, Bank Islam, CIMB, Hong Leong Bank, Maybank, Public Bank and RHB Bank. Left: Top-up your Razer Pay wallet at 7-Eleven or via online banking. / Right: You can even donate to Tabung Harapan using Razer Pay. Peer-to-peer cash transfers is possible. You can also transfer money from the Razer Pay e-wallet to bank accounts. Razer Pay allows you to pay for your iflix subscription and even buy PlayStation credits. Pin codes for services such as zGold MOLPoints, Steam Wallet, Garena, Sony PlayStation, Spotify, iflix, Astro NJOI and more can be purchased on Razer Pay. Prepaid mobile customers can also choose to top up their accounts with Razer Pay if they have an account with uMobile, Digi, Maxis, Celcom and more. According to the press release, over 6,000 major retail and F&B outlets will accept Razer Pay. Some of the vendors listed include 7-Eleven, Starbucks, Singer, Cosway, Greyhound Café, Wendy’s, Kenny Rogers, Krispy Kreme, 99 Speedmart, Tealive, Thundermatch, Sweet Hut and more. 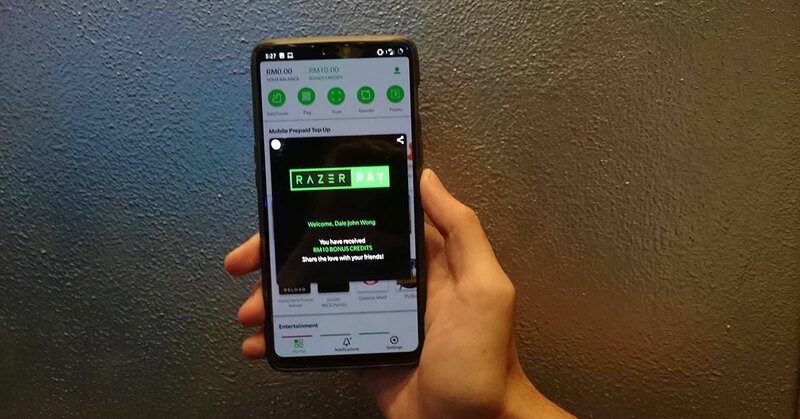 Razer Pay also has plans to grow its merchant network to cover F&B, healthcare, travel and other lifestyle services in Malaysia. Contribute to Tabung Harapan Malaysia. As one of Razer Pay’s partners, Berjaya Corporation Berhad has pledged to donate up to RM5 million to the Tabung Harapan. From July 4 to Aug 30, 2018, Berjaya has committed to donating RM10 with each first use of the Razer Pay wallet at participating Berjaya outlets. In conjunction with its Malaysian launch, every new user in Malaysia will receive RM10 bonus credits when they sign up in the Razer Pay app from July 4 to 30 September 2018. After signing up with a valid local mobile number, users will receive those credits. You can download the Razer Pay app on the Apple App Store or the Google Play Store.